DAPL | Dairy Automation Pvt. Ltd. Welcome to Dairy Automation Pvt. Ltd.
DAPL (formerly e-Doodh Solutions Pvt.Ltd) has emerged as a leading innovator and implementor of cost-effective cutting-edge technology based solutions for the Dairy industry. DA offers state-of-the-art technology that enhances the value to customers through a combination of multiple high-end technologies for complete solutions. At DAPL, Perfection has always been the driving force and Innovation has been the key of success. DAPL offers the fully computerized CIP system on a turnkey basis which includes design, supply, installation and commissioning. To stay globally competitive, one must continually optimize productivity and profitability of technical teams. This requires a flexible, dependable and competent partner with solutions for every operational stage of plant design and development. 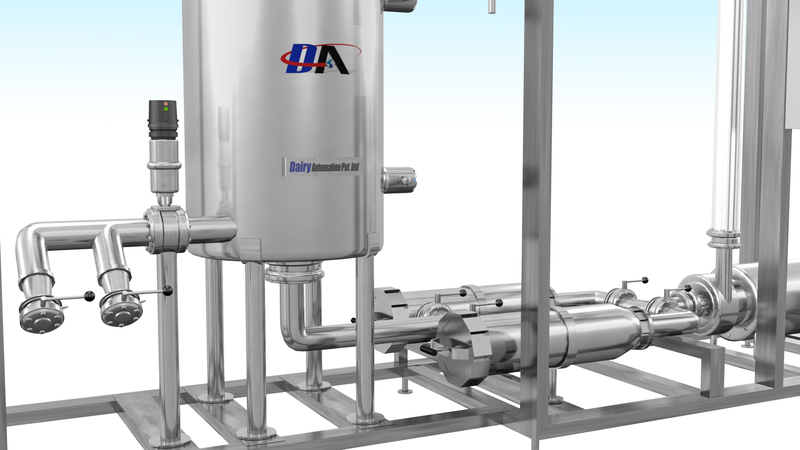 Dairy Automation provides various innovative equipments in the Beverage and Brewery industries for different processes we design. cutting-edge technology based solutions for the Dairy industry. the smooth running of plants. At DAPL we have complete integrated software solutions for the smooth running of plants- Be it in the areas of product processing or in the CIP's of various lines, tanks concerned with production. Also, we offer to upgrade and/or expand your plant operations with the existing equipments set up by incorporating the latest solutions to provide a cost-effective automated plant with an emphasis on energy savings. We are working continually to innovate new products based on need-based ideas and plan to come up with new, unique and cost-driven solutions for the dairy/brewery and beverage industries. DAPL presents an amazing cleaning-solution-based- equipment system that performs all the tasks with speed and accuracy and at the same time proves to be cost-effective too. This system is called the 'Clean Master' and is available in 4 skid-mounted models depending on the technical and budgetary requirements of the plant. This service is for plants with an installed base of existing old/ obsolete equipments which are not in synchronization with the present processing needs. The Manufacturing Execution System is suitable for manufacturing and equipment performance, production execution, quality and tracking. This is for automation equipment offering maintenance and support programs, spare parts etc maintaining and improving conditions to maximize plant uptime. This is to link plant floor automation systems to customer's enterprise. This system consists of PLC and HMI for plant-wide automation. technically and culturally to make your project a success. Our Products & Solutions division provides Production Management and Plant Intelligence Solutions that help manufacturers connect and integrate their shop floor to top floor thus providing real time visibility. It is our policy to develop and supply products of quality that meet the needs and expectations of our esteemed customers. We shall implement an appropriate Quality Management System for this purpose, which will be regularly audited and improved. We shall provide assistance, where required, to our customers to enable them to derive expected benefits from the use of our services & products. We are committed to the quality of our products and the services provided to satisfy the customer. We commit to savings in processing through cost-driven solutions in automation. Together we satisfy the needs of a growing global community in a responsible manner. To be recognized as a preferred professional service supplier with customers by providing end-to-end solution based on requirement. To deliver market defining high quality solutions in the areas of dairy/food automation that create value and sustain competitive advantage for our customers. To do better than the best. Our core values stem from our belief that our clients are at the heart of everything we do. Each and every one of us, directly or indirectly, account for our clients need. Our core values – integrity, accountability and commitment to our clients. We do not compromise on quality. We work continuously on better and tailor-made solutions to ensure minimum operating costs and a zero-tolerance product. We ensure value addition in our solutions and we dare to lead with a focus beyond tomorrow and take opportunities to learn, innovate and grow. We embrace a culture at e-Doodh where diverse ideas produce the best solutions. We take responsibility for our actions and contribute to the betterment of our customers. © 2016 Dairy Automation Pvt. Ltd.